20 November 2018 — Our Post-Release Monitoring (PRM) team from Camp Nles Mamse recently set off on a daily patrol to track released orangutans in the Kehje Sewen Forest. Our PRM team members never know which orangutans, or how many of them, they will encounter whilst on patrol in this vast, wild environment. At around noon on this particular day, the team was resting at the helipad area to check orangutan signals when all of a sudden, familiar movements and orange hair were spotted in the top of a nearby tree. A quick check of the telemetry equipment confirmed a match for Robert, who was released in April 2017. The team had failed to recognise him, for he had clearly gained weight. With no time to waste, the team followed Robert and monitored him over the next four hours. Robert sat in the same tree for quite some time, content with eating its fruit. He started his forest buffet with some jabon fruit (Antocephalus cinensis), followed by young liana leaves and macaranga fruits. He then moved to the forest floor to pluck and graze on shoots. 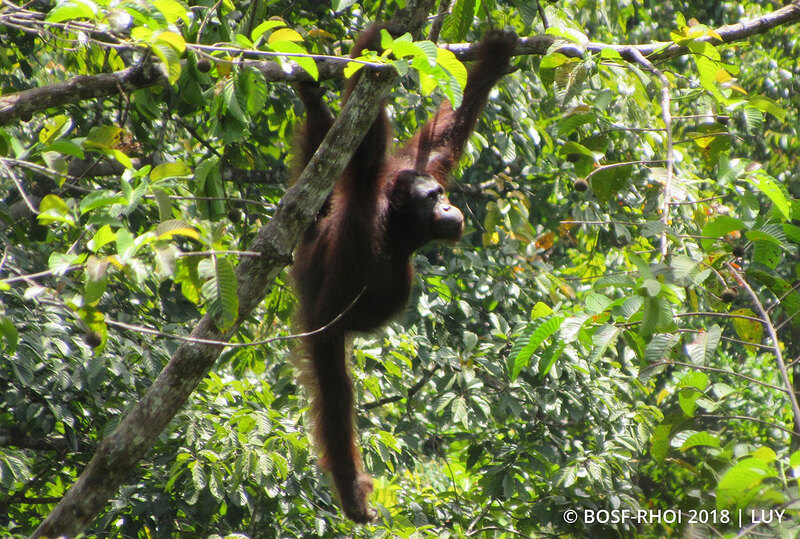 During observations, Robert moved through and around the trees actively in search of food. 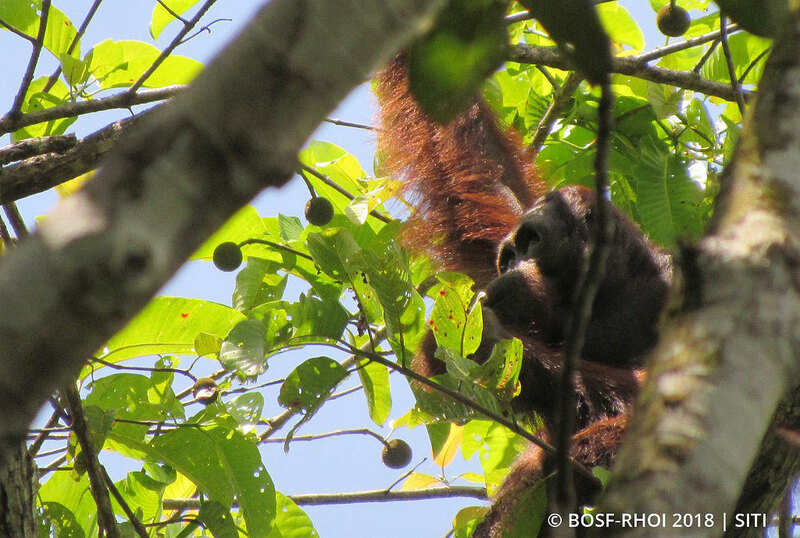 With his exceptional foraging skills, Robert adapted quickly to life in the Kehje Sewen Forest. He has progressed extremely well and is now at a strong, healthy weight. We are thrilled to have found Robert in excellent health, enjoying his surroundings. 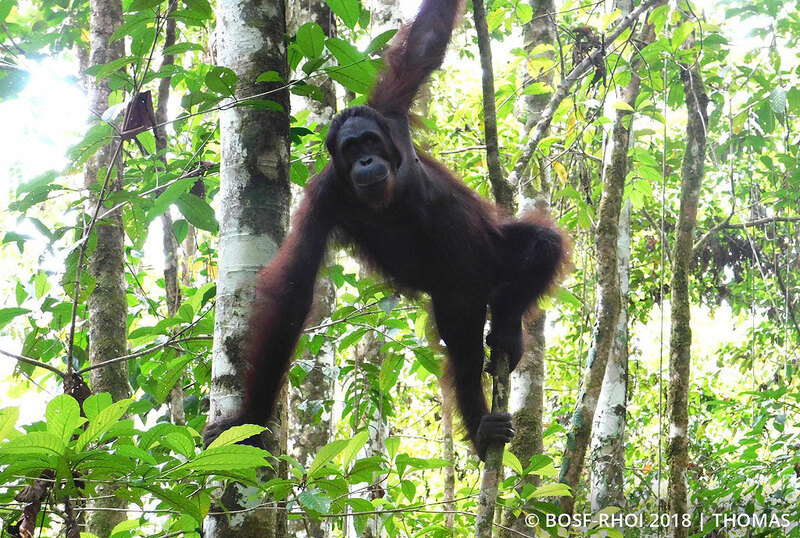 We hope he will continue to explore deeper into the Kehje Sewen Forest and discover more areas rich in natural food sources. Until we meet again, Robert!